RESTON, Va. — Appian (NASDAQ:APPN), provider of a low-code platform that can build fast and powerful enterprise applications, today announced the expansion of its management team in Europe to better meet the demands of digital transformation initiatives across the region. 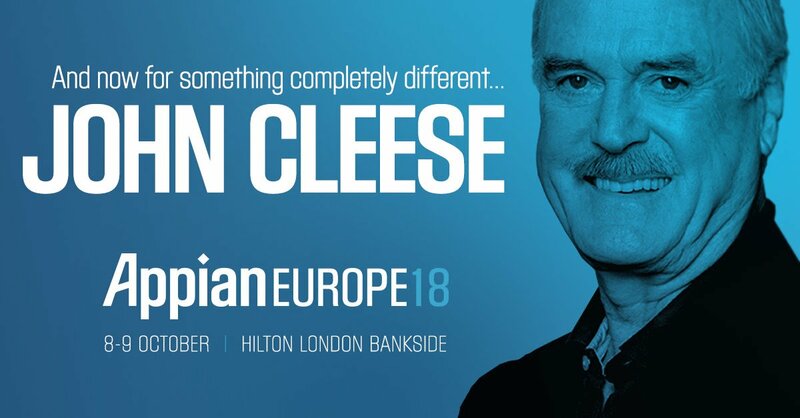 Joining the Appian team is Paul Maguire, Vice President of Europe; Stephane Antona, Vice President of Marketing; and Charlie Thompson, UK Regional Vice President. Companies across the globe are demanding technology for their digital transformation efforts, and Appian is addressing this need through differentiated software – which can streamline operations, increase the ability to be agile, and enhance the customer experience. Over the past several years Appian has experienced growth in Europe. As Europe continues to be a top priority, Appian expects these personnel additions will help capture the opportunity in the European market. Additional background on the executives is summarized below. Paul Maguire, Vice President of Europe: Paul leads Appian’s European operations and has substantial experience growing enterprise software companies into market leaders. Prior to Appian, for the past 20 years Paul has served in Senior Management positions at Genesys, Pegasystems, and Staffware (now Tibco). Paul is committed to helping organizations across Europe achieve success using Appian’s platform. Charlie Thompson, Regional Vice President, UK: With a strong background in leading strategic sales initiatives, Charlie joins Appian to further expand its customer footprint within the digital transformation landscape. With decades of experience, he has held prominent positions at Curo, Pegasystems, and Fujitsu where he delivered new strategies and managed key sales efforts. Stephane Antona, Vice President of Marketing: With over 20 years of software experience, Stephane is focused on serving fast-growing B2B organizations and joined Appian’s office in France to execute marketing initiatives aimed at business development. Prior to Appian, he held executive positions at EasyVista and VMware where he was responsible for a wide range of marketing initiatives. Low-code platforms enable companies to easily create customized business applications with little or no coding. This allows for anyone in the organization to create an application that can streamline the way the business operates – increasing efficiency and lowering costs. Appian currently serves as the engine behind the digital transformation efforts of top customers such as John Lewis, MHRA, Punch Taverns and more within Europe. Appian also recently expanded its Appian Cloud footprint to include local data hosting in the UK and France, allowing customers to build and deploy enterprise applications quickly in a secure environment. Local availability is a key success driver for Appian Cloud. This press release includes forward-looking statements. All statements contained in this press release other than statements of historical facts, including statements regarding Appian’s expansion of its team and in Europe, are forward-looking statements. The words “anticipate,” believe,” “continue,” “estimate,” “expect,” “intend,” “may,” “will” and similar expressions are intended to identify forward-looking statements. Appian has based these forward-looking statements on its current expectations and projections about future events and financial trends that Appian believes may affect its financial condition, results of operations, business strategy, short-term and long-term business operations and objectives and financial needs. These forward-looking statements are subject to a number of risks and uncertainties, including the risks and uncertainties associated with Appian’s expansion in Europe and the additional risks and uncertainties set forth in the “Risk Factors” section of Appian’s prospectus filed pursuant to Rule 424(b)(4) under the Securities Act of 1933, as amended, on May 26, 2017, and subsequent reports that Appian has filed with the Securities and Exchange Commission. Moreover, Appian operates in a very competitive and rapidly changing environment. New risks emerge from time to time. It is not possible for Appian’s management to predict all risks, nor can Appian assess the impact of all factors on its business or the extent to which any factor, or combination of factors, may cause actual results to differ materially from those contained in any forward-looking statements Appian may make. In light of these risks, uncertainties and assumptions, Appian cannot guarantee future results, levels of activity, performance, achievements or events and circumstances reflected in the forward-looking statements will occur. Appian is under no duty to update any of these forward-looking statements after the date of this press release to conform these statements to actual results or revised expectations, except as required by law.